Golden Red. 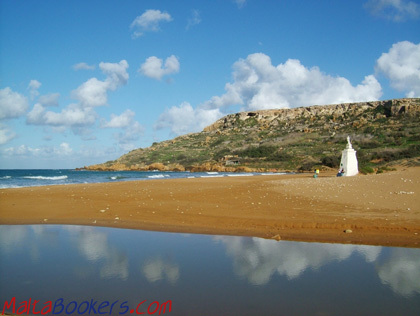 The largest sandy beach on the Island of Gozo. The sand is of a strong red colour, hence the name Ramla il-Hamra, meaning the Red Sandy Beach. Its at the end of a marvelous green valley, surrounded by spectecular views. In the middle of the sandy beach, there is a statue of the Virgin Mary. The legendary Calypso's Cave is at the top of the cliffs on the Western side. This is the cave referred to by Homer in The Odyssey, where the nymph Calypso lived. You can walk up to the cave from the beach. This beach is very easily accessible. Enjoy the views sitting on one of the terraces sipping a beer or coffee. When swimming, stick to the right side as on the left part there's stones once you go in the water. I heard that these stones originate from a wall built by the Romans so that ships couldn't make it to the shore. An excellent beach, if you're in Gozo don't miss it. Getting there. Drive to Nadur and follow the signs to Ramla il-Hamra from there.